Summary: The eastern rim of the River Derwent valley is flanked by a continuous series of gritstone edges which run from Grindleford in the north to the Chatsworth Estate in the south. 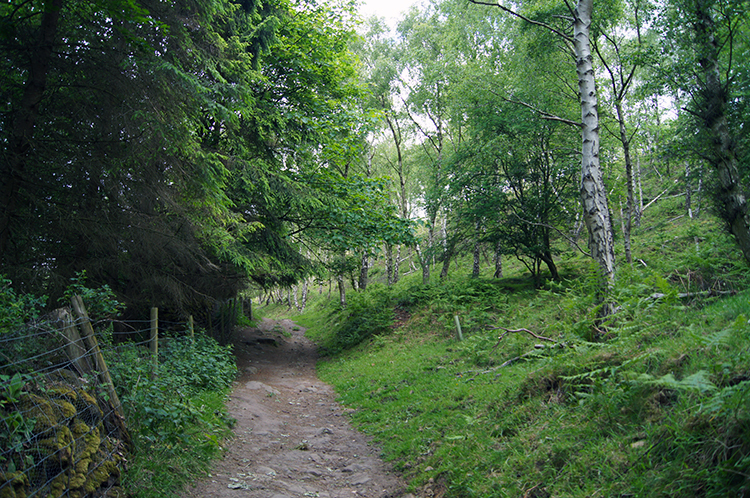 This walk which begins in the village of Curbar heads through luscious Peak District land in a south-east direction to Birchen Edge at the southernmost end of the gritstone edge and then makes its way north mostly via the edges and partly across upland moor plains to the north end of Curbar Edge before tracking back below the edge to the village. 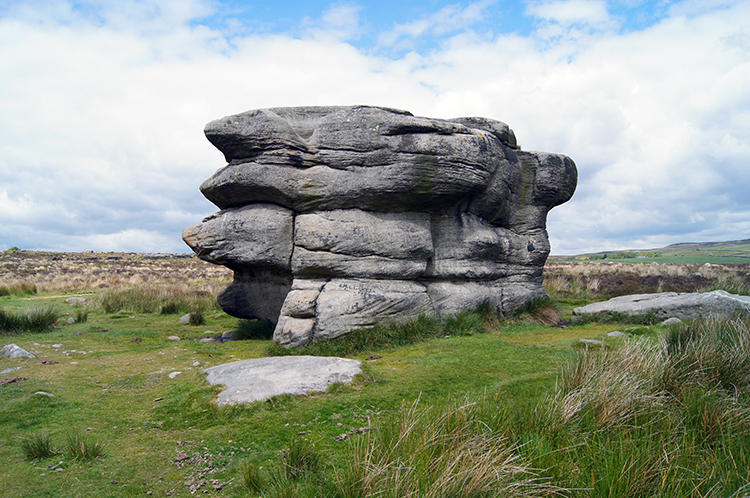 On the walk a series of notable and impressive gritstone features and some landmark monuments to Napoleonic Battles are visited. The Walk: It was a lovely day in early June and with a good weather forecast behind me I decided to make the effort of getting up early and heading from my home in Harrogate on the two hour car journey to Curbar. 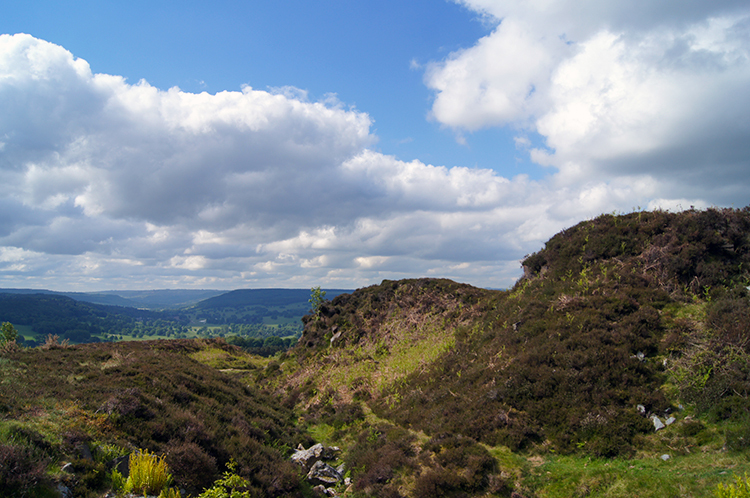 I had been itching to do this gritstone edges walk for some time, having planned it during the winter, but the walking of Offa's Dyke had been my early season priority. With Offa's Dyke done and dusted and with me being the healthier for it I procrastinated no more. The early morning wake up call, breakfast and car journey were accomplished. I was safely parked on the lane leading uphill from the village to the edge. My backpack was packed, I had changed for walking and my boots were on. Let's walk. I don't know if you do the same as I but when I am journeying for a walk I look to the skies in the direction of where the walk is. If it was favourable, I would hope the weather forecast was right. If it was unfavourable, I would hope it was wrong. Or at best an improvement on the forecast. On this occasion there had been no cloud in the sky when I had left home but cloud had bubbled up into the sky by the time I had parked up in Curbar. It had been predicted that way and there were plenty of gaps in the cloud showing blue skies. That was predicted too. 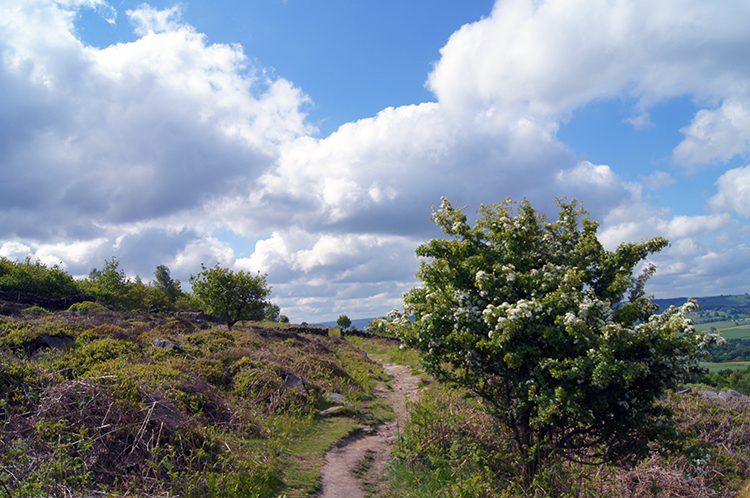 I climbed from Curbar and headed on a path running below and parallel to Baslow Edge. 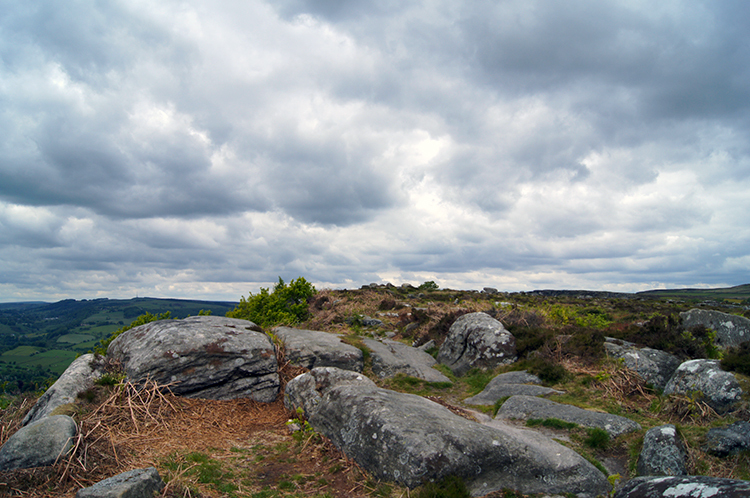 I looked back towards Curbar and Froggatt in the Upper Derwent Valley. Patches of light and patches of shade created moving shapes in the valley as the clouds scuttled across the local skies. It was a gorgeous sight. I turned from the scene and headed on a south-east course following my chosen path. I climbed steadily as I walked and the valley grew more distant from me. 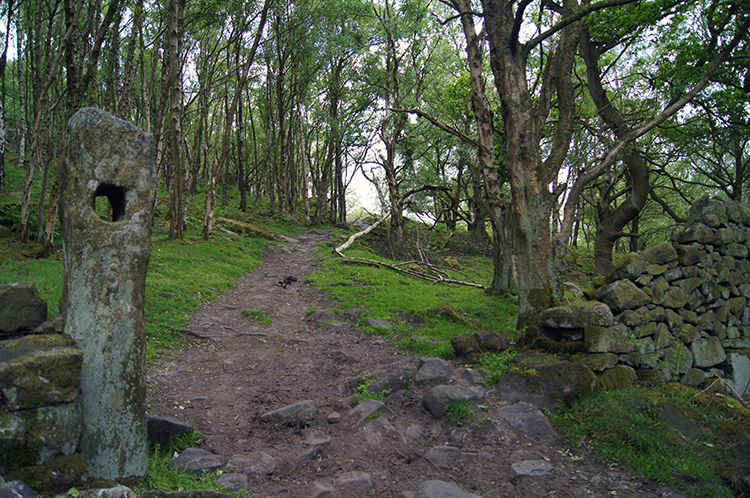 I had made 100 metres of gradual ascent before I leveled off at some old workings just below the crest of Baslow Edge. I could have made a quick climb to the top which was only 15 metres higher but I would be there later and did not want to spoil the moment. Instead I kept to my plotted route and walked on the south edge of woodland which filled the area of Jack Flat. Ancient gnarled Hawthorn guarded the path like wizened old sentries. Strong summer light penetrated the light green early season foliage creating intricate patterned shapes on the ground. I loved it. All of it. 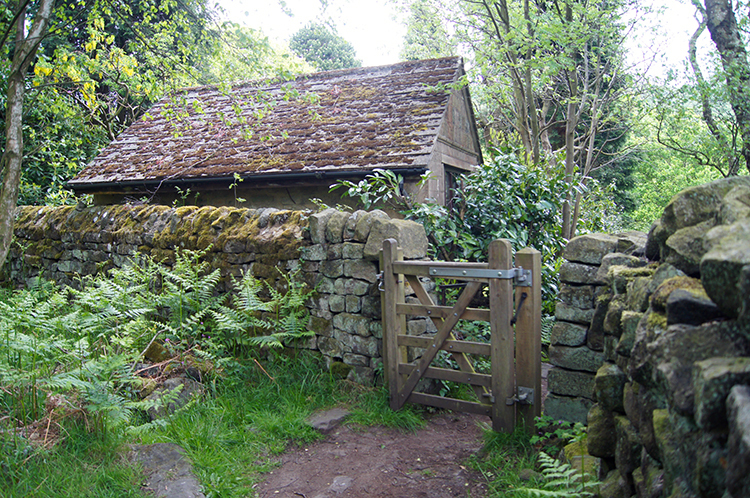 I followed the path around the edge of the woodland which turned from north-east to south-east before reaching some old woodland buildings and a house in an impressive clearing beside Bar Brook which I crossed by a narrow but substantial stone bridge. Soon after crossing the brook I came to the A621 Sheffield Road which I crossed by using the Green Cross Code. I grew up with the Tufty Code as my guidance, it advised "Look left, look right and look left again". Green Cross improved on that good advice by advising us to keep looking right and left as we crossed. I have done ever since. Safe and sound on crossing the Sheffield Road I continued on the path through more woodland, this time running just below Gardom's Edge. The sun had disappeared when I walked in the environs of Gardom's Edge and I cussed a little hoping that the dull of thick cloud would blow away as quickly as it had came. Out of the woods on a elevated plain of mostly grass with patches of fern the fullness of cloud was shown to be all around. My disappointment at the local darkened conditions was tempered by bright meetings with a few dog walkers. Everyone seemed cheered. The dogs I came across were all well behaved and with no livestock in sight they ran free having lots of fun. 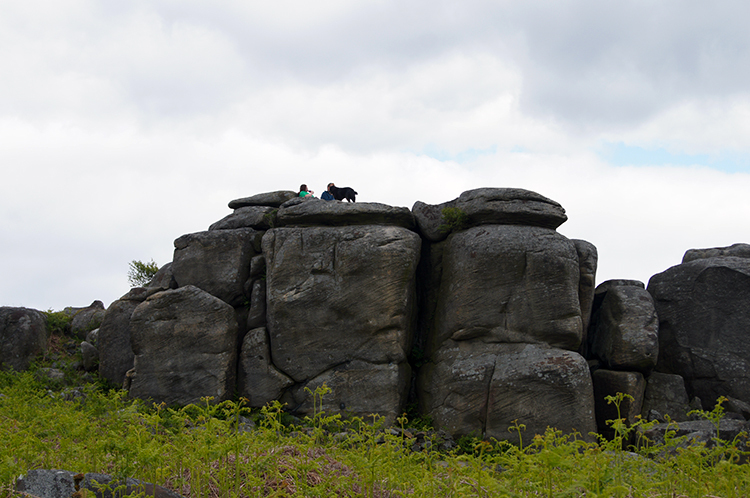 I chatted away to a few and then waved to a lady with her dog who was sitting high on an isolated gritstone outcrop in the field. After my meetings and the acknowledgment I continued on across a wide sparse and poor grassed field towards the A619 road at Robin Hood. I left the field by a walkers gate and reached the road but did not need to cross it. 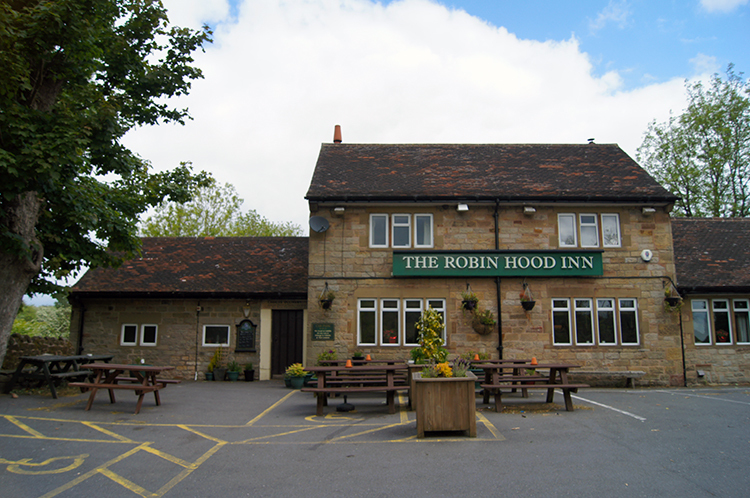 I followed a tarmac path on a curved course to the Robin Hood Inn. It was a little early for inn goers taking lunch and all was quite as I walked by the pub. Just after the pub and a neighbouring couple of houses I followed a wood lined path leading away from the road and up towards Birchen Edge. My anticipated series of thrills on the edge was getting close. I was soon up on Birchen Edge and getting to the top excited me. I completely lost myself in childish fun immediately. I spotted a needle on the edge of Birchen Edge about a couple of hundred metres ahead of me and knew from the map it had to be Nelson's Monument. The map showed Three Ships next to the monument. What were they? I hurried along to find out. First I reached a fun bit of escarpment which I could scramble so I did so. I said I was having fun didn't I? Up and down on the edge I went and after I had my fill of that action I spotted the Three Ships which are actually three large boulders naturally set in line with each other. I checked them out. So what is it about Nelson’s Monument and The Three Ships? And why are they sited together? The fact is that Nelson's Monument was erected on the instructions of local business man John Brightman in 1810 to honour Admiral Lord Nelson's victory and death at the Battle of Trafalgar in 1805. The Three Ships, being conveniently on the site have been assigned the distinction and thus the designation of HMS Victory, HMS Defiance and HMS Royal Soverin. Each ship name is engraved on each stone. Splice the mainbrace! 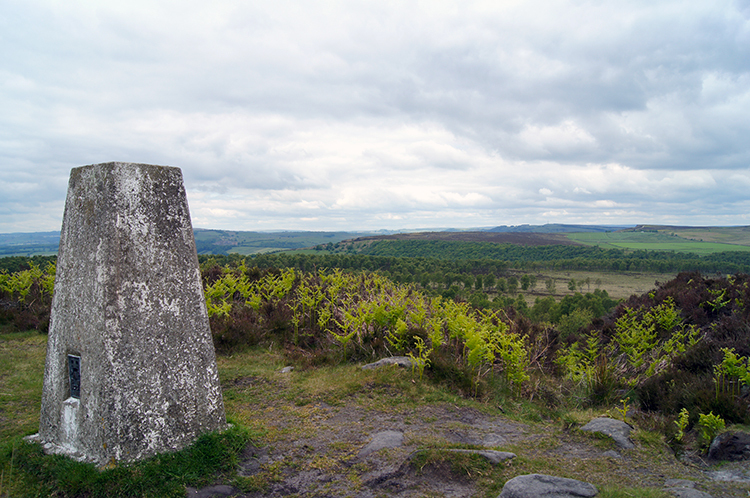 Near to the monument and the ships was my next point of call, the trig point in Birchen Edge. 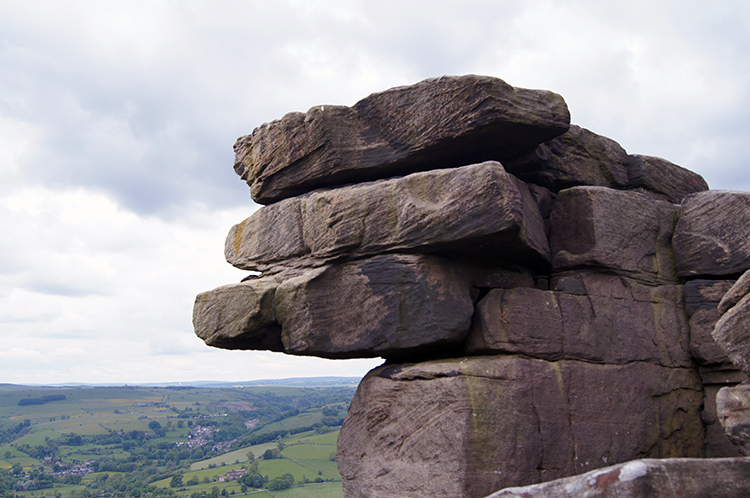 At 310 metres high it is at the north end of where Birchen Edge visibly peters out. With the line of gritstone out of sight I continued on a course north to a crossroads when Sheffield Road which I had crossed earlier is dissected by an unassigned minor road. 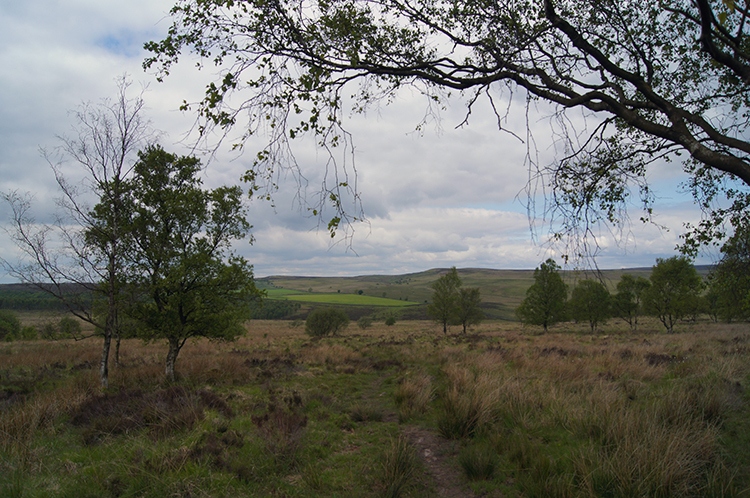 To get there I had to cross an exposed right to roam unpathed upland plain of scrub and heavy grasses. I made a meandering course to avoid boggy patches which though taking me off a true line was never too arduous. Funnily enough on this unpathed section I saw other groups of walkers doing exactly the same. I eventually completed my wander over the field and arrived at the crossroads dry footed. I saw a funny sight as I paused at the crossroads to take a drink. a group of about a half dozen young Asians walked past me heading north on Sheffield Road. They crossed the minor road and continued on another 50 metres or so before stopping. Then one by one they all turned back and crossed the minor road before walking past me once more, this time heading south on the Sheffield Road. They continued another 50 metres or so and then reached a Bus Stop which I think they had been stood at when I first saw them. They never moved from there again, at least not while in my sight. After the comedy I followed a path running alongside a field wall south-west towards Eaglestone Flat. Soon I reacquainted myself with Eagle Stone and then with Wellington's Monument, both of which I had also visited 11 years earlier. 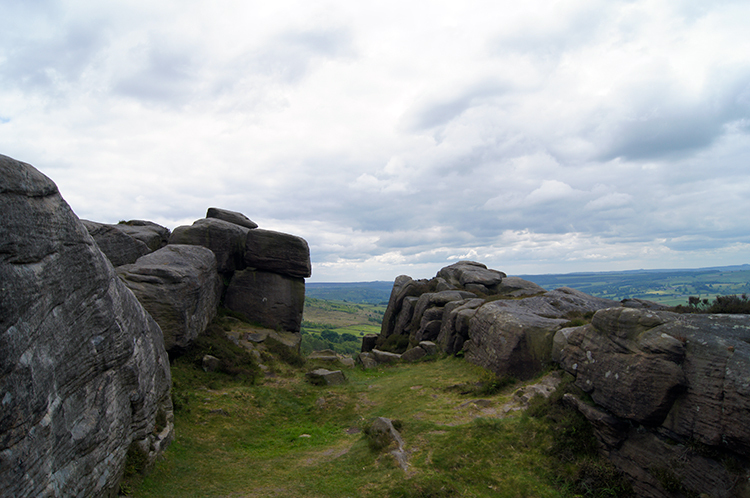 I was on familiar ground while on Baslow Edge and across to Curbar Edge. 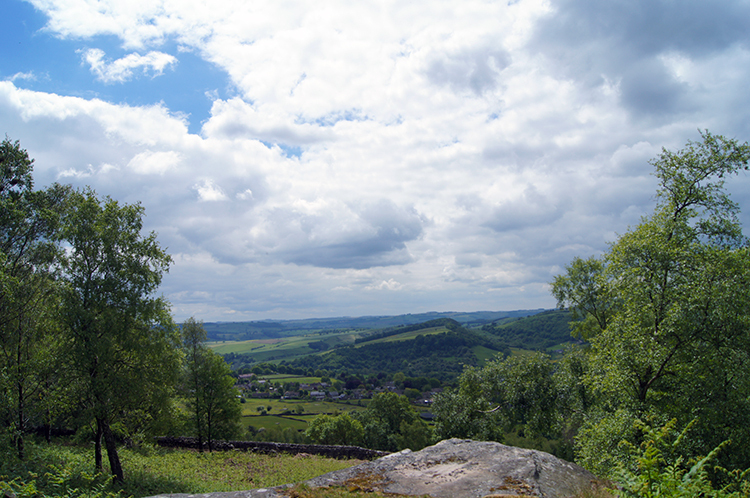 I renewed my friendly acquaintance with Baslow Edge. 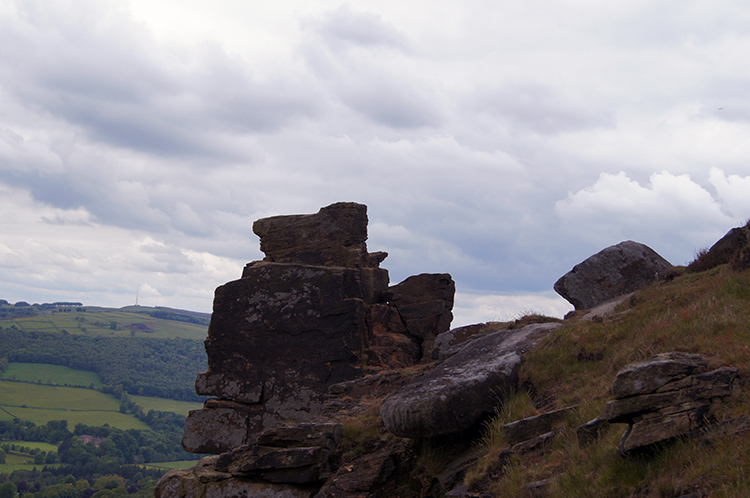 It was every bit as much fun as the first time when I had played along the course of the gritstone escarpment. I marveled at the sights afforded me. Of the remarkable shapes created by the forces of nature. Shapely stacks appeared before me which changed appearance as I passed them by. One after another. When I could safely climb to the top of an outcrop I did so. 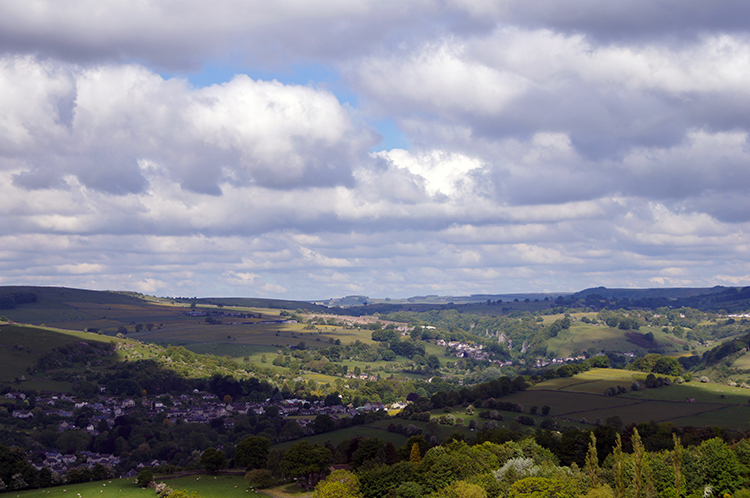 And when I paused to reflect I looked out and over to the marvel of the Peak District laid out before me. Extensive views were present to the west which included the beautiful grounds of the Chatsworth Estate. 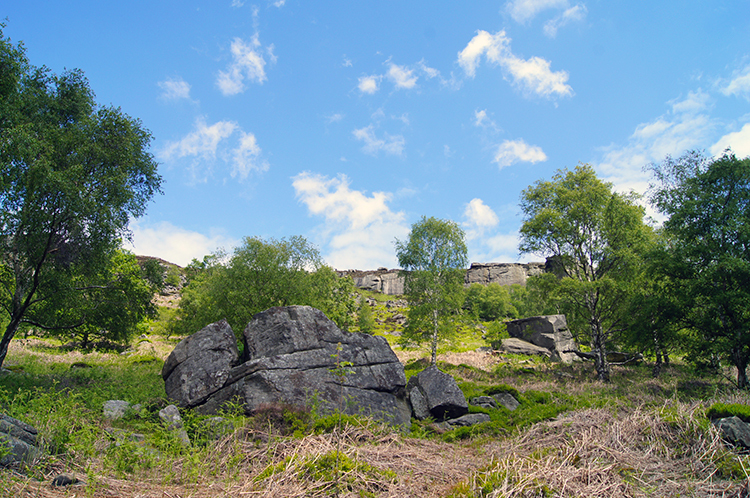 Each time I resumed my walk I bounded in and around the scattering of gritstone laid beside Baslow Edge. I had a great deal of enjoyment. 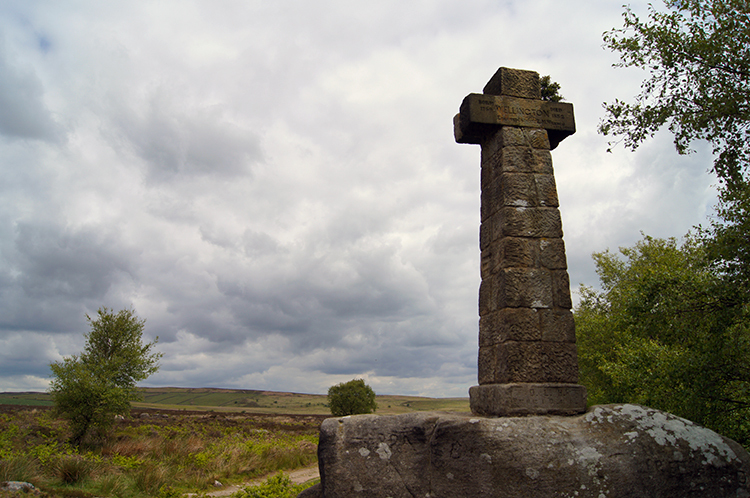 I reached a road crossing which heralded the end of my walk along Baslow Edge. 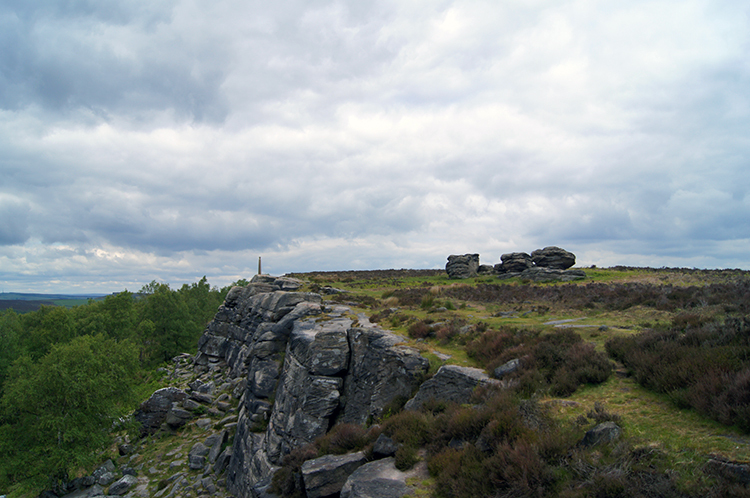 On crossing the road I began my walk northwards along the top of Curbar Edge. It was as much fun walking the line as I had just enjoyed on Baslow Edge. Once again I bounded along with the attitude of a youngster. Only when I met fellow walkers did I temper my frivolity and behave like an adult to pass courtesy. 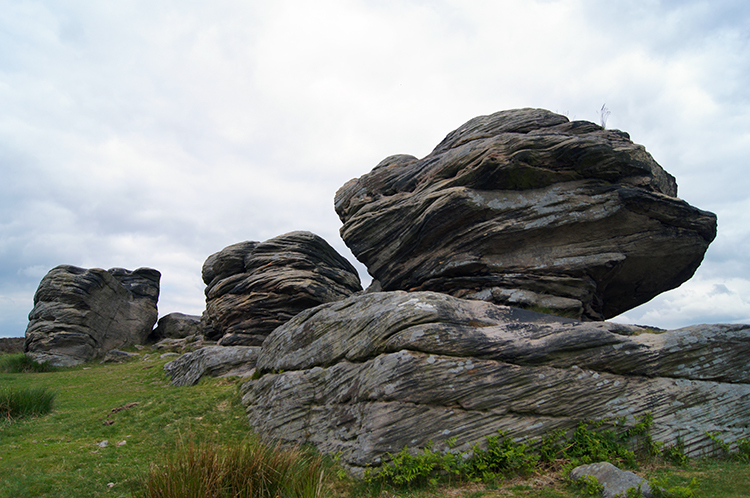 Then when free of company I played again, bounding up and over rocks and in between the sheltering channels between elevated lines of gritstone. 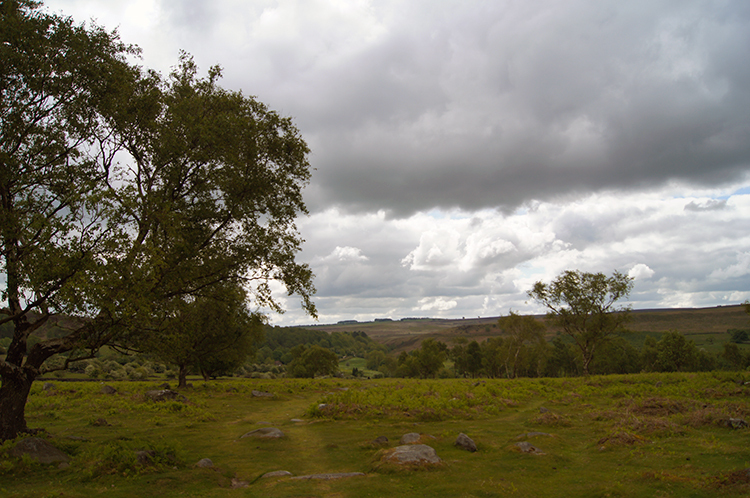 And once again, when I could do so safely, I climbed onto the tops of the gritstone sentinels and edged myself cautiously to the edges to look down on the tree tops of the sheltered woodland below. I couldn't help myself. 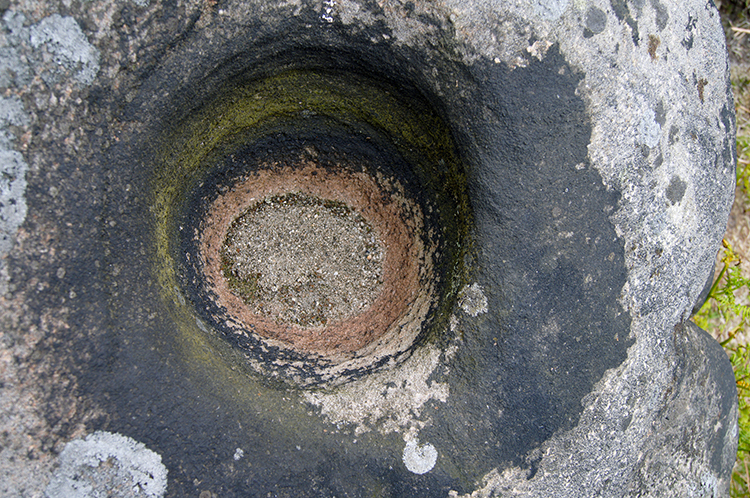 On inspection of the top stones I noticed symmetrical hollows in the stone where weaknesses had been penetrated by water to form pools. They were all dried out due to recent lack of rain. After a little more fun on the top side of Curbar Edge I reached the point where I had to leave and make my way down below the gritstone line to the woodland below. As if by magic as I left the top line of the scarp the sun returned to the scene and warmed the day. My finale through the wood was enjoyed with the additional brightness of dappled light piercing the woodland and highlighting the path in front of me. 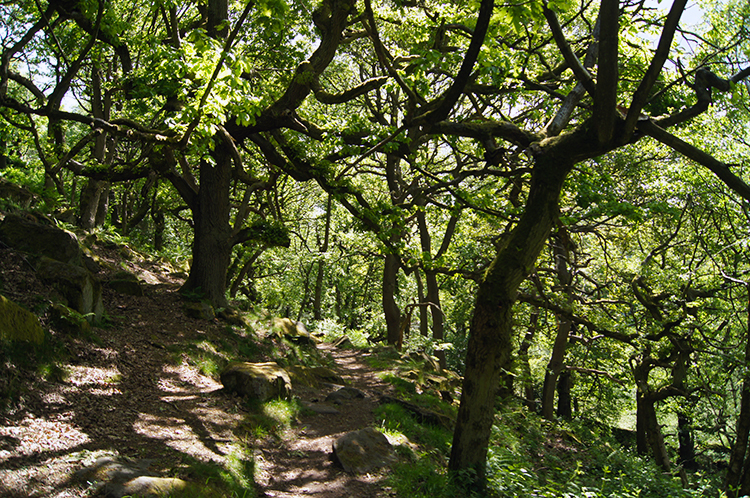 I looked up through the mass of trees when possible to spy the gritstone being bathed in sunlight once more. As earlier, it was a gorgeous sight. 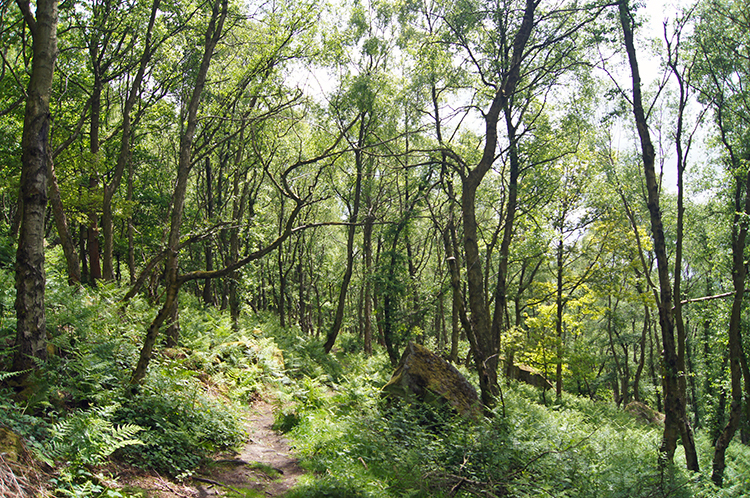 I continued on through the woodland and reached a clearing just above Warren Lodge. As I did so the clouds appeared the fizzle out completely which permitted my finale to be enjoyed in unbroken sunshine. I finished my walk in conditions which I had set off in. And I can say the indiscretion of cloud filling the middle of the walk did not temper my whole enjoyment of it in any way. On the edges I had been entertained every step of the way by the meeting of constant eyeopeners which began with the monument and three ships on Birchen Edge, which continued to the Eagle Stone, monument and shapely forms of Baslow Edge and reached a crescendo of a finale on the brilliance of Curbar Edge. The joy this walk brings. The stupendous sights it reveals. Oh, what fun I had.